eFlex Systems is a recognized industry leader in the design and implementation of advanced technology and MES solutions for the discrete manufacturing market. Our goal is to provide solutions tailored to meet specific manufacturing needs whether it is developing a global MES solution for many manufacturing plants, a single plant-wide solution or targeted at one specific assembly line or area within a plant. With a commitment to innovation and excellence, we aim at solving our customers operational needs with scalable, reliable and secure software solutions. We help manufacturers meet regulatory standards, improve quality, productivity and competitiveness within their industry. Our MES solutions are modular, web-based and displayed on one simple application platform. Customers can start with electronic work instructions to begin the paperless factory transformation and add traceabilty and quality measures as they become more automated with error proofing. On the other hand, highly automated smart factories may utilize all the MES solutions with cloud computing and advanced analytics. Customers choose the specific modules they need to optimize their operations with the ability to add more in the future as needed. We believe in long-term partnerships with customers built on trust, support and continuous innovation. Manufacturers worldwide trust eFlex to transform them into modern manufacturing environments with cutting edge technology, lean operations, and real-time visibility and transparency into the entire production process. Provide our customers with the flexibility and efficiency to realize sustainable, world-class manufacturing. How does eFlex Systems make successful applications and solutions for advanced manufacturing? With an amazing team of developers, designers, engineers, integrators, project managers and loads of innovation and ingenuity! Our team has over 90 years experience within the manufacturing industry. We understand the manufacturing process, what software capabilities are important to the industry, how end-users will interact with applications, and how to provide value to organizations. We possess the experience and expertise required to ensure the successful implementation of BOTH manual and automated production optimization projects, regardless of the scope or complexity. We know our stuff and we can't wait to learn about yours. 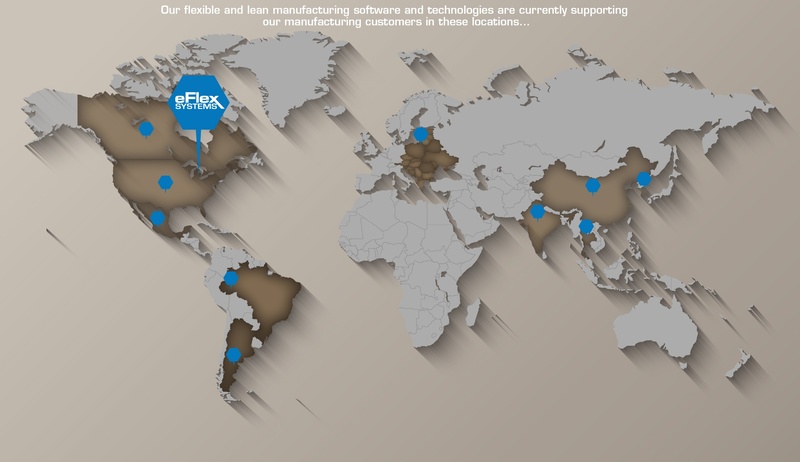 As a world-class manufacturing software company, eFlex Systems serves global customers with installations on 4 continents and in 12 countries. Areas served include: Argentina, Brazil, Canada, China, Eastern Europe, India, Korea, Mexico, United States and Thailand.